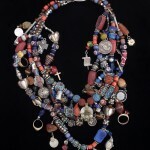 The original necklace measured 96 inches. I remember buying it in Houston and only occasionally, looping it two or three times around my neck, wearing it. I owned it, admired it, kept it but never really fully enjoyed it. Jane, my friend and beading mentor, offered a running commentary as I started making 1-3/4″ to 2-1/2″ charms. Twenty-seven charms later, I began to string the necklace. Five strands of beads I totally loved. That little Greek coin we found in St. John, U.S.V.I. My treasure necklace now lives on my dresser. I see it everyday and love it all over again and again and yet again. 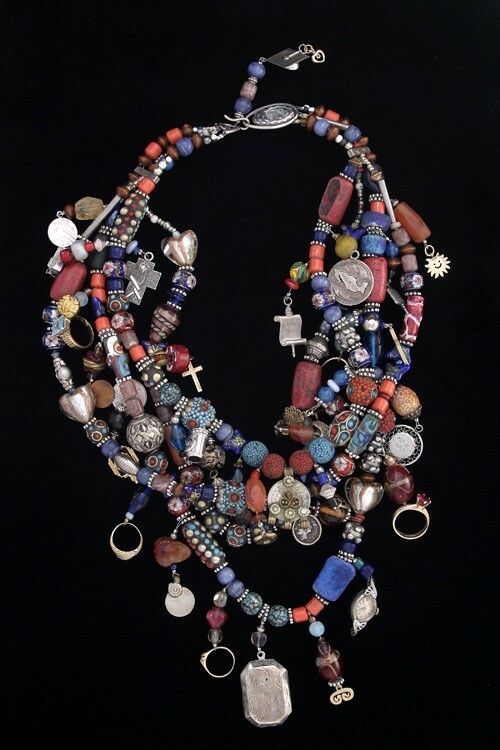 When I wear the treasure, those once-lonely beads inspire others. I understand. Treasure Necklace inspires me too.